Cardiff City will re-open the Ninian Stand extension for the first time this season when they face Championship play-off rivals Derby County on Saturday. The upper tier, built in 2014, was temporarily closed for Cardiff games a year ago due to poor ticket sales. But the Bluebirds hope re-opening the stand will help attract a crowd of more than 26,000. "The club has worked tirelessly this week," manager Russell Slade said. "It's all good positivity that we require with eight games to go. "The crowd is pulling in the right direction, getting right behind the team, and the team giving absolutely everything on the pitch is a dangerous situation for any team that's visiting us." 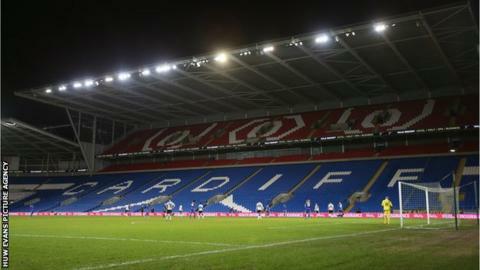 Cardiff said on Friday morning they had sold nearly 25,000 tickets for the visit of Darren Wassall's side. "We're looking for a bright and tight performance. That's the standard we've set at home," Slade added. "We only lose the game if we fail to fight tooth and nail for the points on Saturday and deliver a performance and give everything we've got," said Slade. "They're not going to come much bigger at this stage of the season. We are looking forward to the challenge and embrace it in front of, hopefully, our biggest crowd of the season. "We're not completely out of it until it's mathematically impossible but it would be a huge blow not to take all three points." Cardiff and Scotland goalkeeper David Marshall is recovering from pneumonia and is a doubt for the game while defenders Fabio and Matthew Connolly could also miss out because of illness.